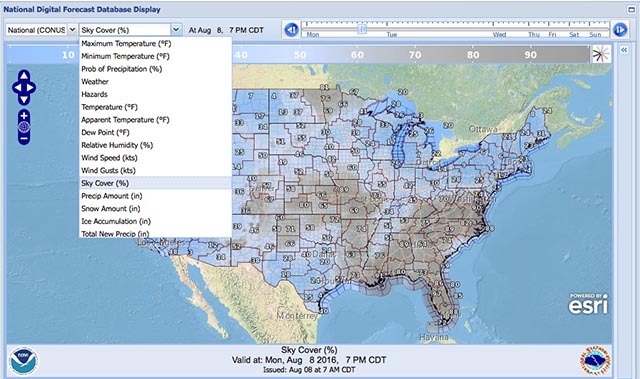 The National Weather Service has a new interactive map of their National Digital Forecast Database. This tool does a great job of visualizing how weather will develop on an hour by hour basis over the next week. Sixteen different measurements can be displayed including: temperatures, dew point, sky cover, and precipitation. Over time, they plan to phase out some of their existing web tools in favor of this. I've added this tool to the Forecast page so that it is easily at hand. It starts up showing sky cover over Texas.